The 2010’s Housewife: I have some 'splaning to do! I have some 'splaning to do! First off, I'm sorry I lied. When I posted last, back in September 2011, I said I needed to take a month away from blogging but that I would be back in October. Yea... that was 14 months ago. So technically, I lied. But I promise it was for a good reason and I'm really hoping you are a "better late than never" sorta person! His name is Bug (not really, but that is what we call him) and he is now 10 months old. 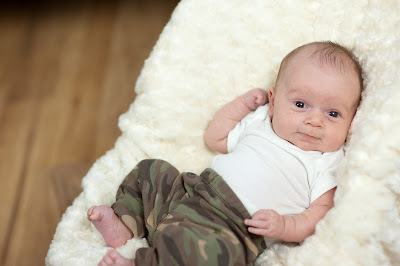 Yep, Mrs. 2010's Housewife is a mommy! SURPRISE! I am sooo going to get one of those t-shirts that says "I'm so crafty, I make people." I just told a friend today that everyone knows a child is going to change their life, but no one is prepared for just how much! Becoming his Mom has not only added to my life, it has made me a completely different person. I have missed blogging, but not everything about it. I don't miss the pressure to blog everyday or the fact that keeping track of advertisers/sponsors/giveaways was a full-time job. This time around, blogging will be something that adds to my life- not adds stress to my life! I learned a big lesson when I decided to dust off the virtual cover of my blog book after months of inactivity. What did I find? 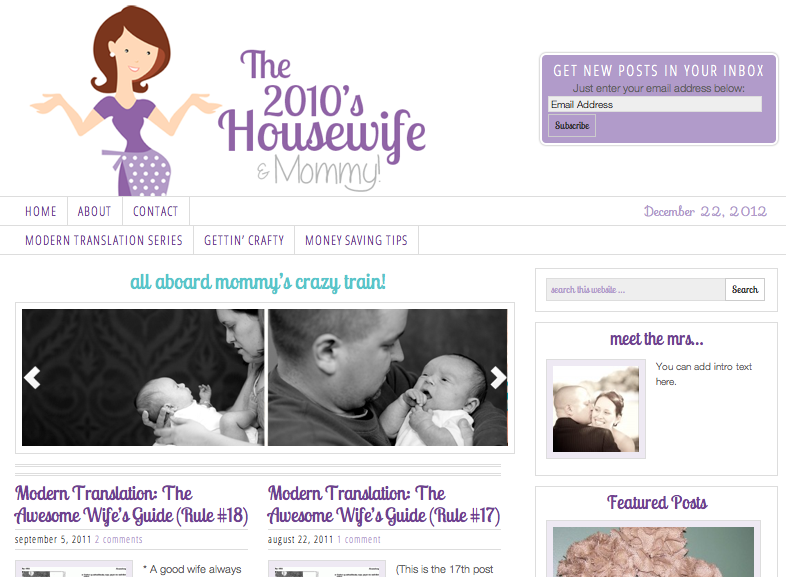 The 2010's Housewife has had more traffic the last 14 months than it did when I was posting multiple times a day! What does that tell me? You like me... you really like me! :) For that reason I'm giving you the new & improved Mrs. Housewife (+ mommy). I hope you like it! I have been working with an amazing designer named Sara from MoonsteamDesign, who has been so helpful, enthusiastic and encouraging! I want to say that this time around I am going to try to post only what my readers want to read, but in all honesty, I'm probably just going to be posting what I feel like talking about. My hope is that you are still interested! But if at the end of the day, it's just me left standing I'll be okay with that. I'm sure my mom will continue reading so I'm guaranteed at least one follower! Thank you for reading and I hope you enjoy following along on my new adventure as Mrs. 2010s Housewife + Mommy! Greate article. Keep ωriting such kind οf info on yоur blоg. Im really imрreѕѕeԁ by your blog. benefiteԁ from this web ѕіte. You could substitute a cheap plate for the charger. Every time I go into A.
light that tells the cook the product is done. will get to see the difference, as their teeth look brighter and feel smoother and thus, cleaner. engine to find a free website that permits you to post photographs and videos. and possess the ability to dry 40% faster than other similar face cloths. You can also run the product that you are interested in with your family doctor or dermatologist. This is great since I don't need to grab a pot holder or towel to open the lid. I highly recommend the Crock-Pot Cook Carry Countdown Slow Cooker as a great slow cooker that any household would be grateful to have. Rinse and soak the beans in a pot or large bowl covered with 3-4 inches of cold water. a day:. Take a chest press for example; the main muscle worked is the chest, secondary maybe the triceps. It's truly a nice and helpful piece of information. I am satisfied that you just shared this helpful information with us. Please stay us up to date like this. Thank you for sharing. I read this piece of writing fully on the topic of the comparison of most recent and preceding technologies, it's remarkable article. get home. I'm shocked at how fast your blog loaded on my phone .. I'm not even using WIFI, just 3G . wait to take a look when I get home. I'm surprised at how quick your blog loaded on my cell phone .. I'm not even using WIFI, just 3G . Great items from you, man. I have take into account your stuff prior to and you are just extremely fantastic. sensible. I can't wait to read far more from you. This is actually a wonderful website. I'm very happy to uncover this web site. I need to to thank you for your time for this particularly fantastic read!! I definitely loved every bit of it and I have you book-marked to see new stuff in your blog. i could suppose you're a professional in this subject. Well along with your permission let me to seize your feed to keep up to date with drawing close post. Thank you one million and please carry on the gratifying work. blog and wanted to say that I've really enjoyed browsing your blog posts. In any case I will be subscribing to your feed and I hope you write again very soon! numerous websites for about a year and am nervous about switching to another platform. to see internet and on web I found this web site as a best site for most up-to-date updates. My name is Tracy and my #1 priority is being a wife. I enjoy being a Mrs., host, party planner, amateur Martha and gift giver, but if I’m ever going to reach my goal of being a stay-at-home mom I’m going to have to take frugal to a whole new level! A Rock & Roll Party! ©Tracy Billet. Header image by BLACKLEAF STUDIO. Simple theme. Powered by Blogger.